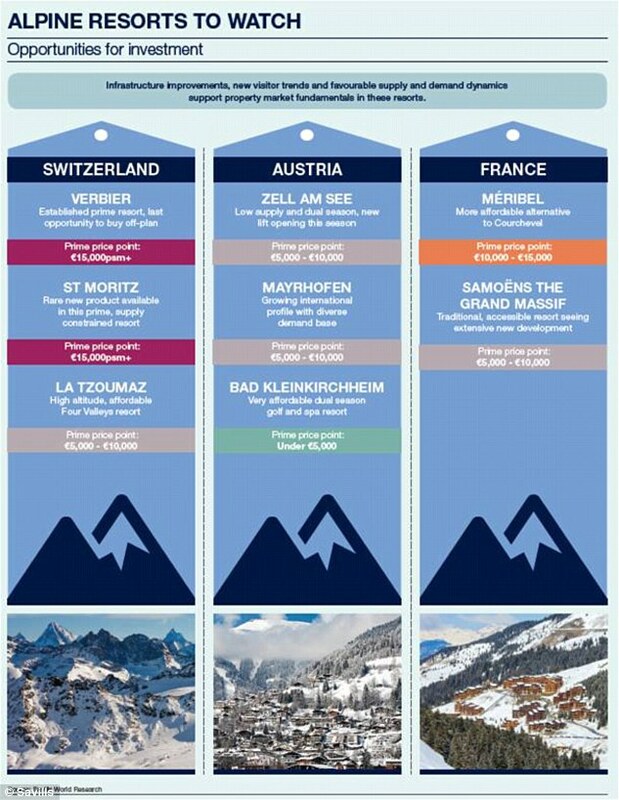 If you’re considering buying a ski property, you’re spoilt for choice in Europe -whether it’s high-altitude black runs you’re after or plenty of après-ski. But make sure you take into account the following five factors before taking the plunge to ensure you make the most of your investment in a mountain home. The range of issues includes choosing the right type of location to maximize the rental potential to taking advantage of low mortgage rates overseas. If you’re going to invest in an alpine home, then you’ll be looking for an area that will continue to be in demand. But the demands of skiers and snowboarders is changing, and resorts need to adopt to these changes if they are going to survive, according to research by estate agents Savills. Savills claimed that, until now, the dominant age group of people on the slopes in Europe has been so-called Babyboomers who are over the age 50 and combine relatively good health and income. But as they age, their numbers have begun to decline and they are being replaced by a new generation of millennials. This so-called Generation Y has been shaped by technology but is often time-poor and burdened by student debt – and so has different requirements than the Baby Boomers before them. ‘They need a ski experience relevant to them and resorts are having to realign their offering,’ explains Jeremy Rollason, managing director of Savills Alpine Homes. This includes wifi on the slopes, modern ski lifts and a move away from traditional rustic ski hotels to more contemporary offerings. Resorts are also diversifying their offerings with cooking or music festivals, such as Snowbombing in Mayrhofen. Resorts also need to extend their offering throughout the year, meaning that are not just popular among skiers and snowboarders in the winter, but also have appeal during the summer months among hikers and mountain bikers. In other words, it means they have what is known as ‘dual seasonality’, meaning they are busy and can attract visitors every month. Buying a ski chalet or apartment tends to be generational, according to the report by Savills. It found that 41 per cent of buyers are aged between 40 and 49, and 33 per cent of buyers aged between 50 and 59. It leaves just 15 per cent of buyers aged between 30 and 39, and 10 per cent between the ages of 60 and 69. For families, buying a chalet is often an investment as well as a lifestyle opportunity (such as being able to use the chalet during half term for a family holiday). Borrowing money is far cheaper in Europe, with rates at historically low levels. Unfortunately, due to the pound’s heavy falls since the Brexit vote, the cost of doing so has risen after exchange rates are factored in. The pound is very volatile at the moment and could fall further. Make sure you factor this into your calculations. Finding a good currency broker can save you tens of thousands of pounds on a ski property purchase. Following the movement in the value of the pound this week, Daniel Webber, of FX Compared, suggested that some buyers may lock in the current exchange rate with a forward contract. He said: ‘With the pound coming off one of its worst days ever against the euro today (down to a low of 1.11 euros to the pound), potential buyers are left having to make a number of tough choices.